Do you work for SOLIDWORKS? Learning about SOLIDWORKS? We can help. "Awesome design tool for professional and students"
Ease of use, Solidworks is easier to learn and very easy to gain expertise. The tools and templates available within the software is good enough for basic learning. Files can be exported and imported in different formats. This makes the software versatile for usage. Readily available templates and parts help a lot in designing and time savings. Simulation is a great tool for parts design. It has different modules for different types of jobs. These modules make it easier to navigate. The user interface is very friendly and easy to use. Lots of companies use Solidworks for their design needs. So, files can be shared with different clients. Solidworks sometimes gets stuck while processing multiple parts. In 3D parts design, the combination can be tricky. Sometimes, its time consuming to form an object from different parts. Auto dimension option can be improved to make things easier. Simulation function in basic software can be improved for better results. Rendering can be improved in the basic software version. Better rendering would help in presentation and design needs. Sometimes, file import from another software can be tricky and does not work very well. With multiple parts open in design window, the software can give slower performance. Start leaning from online videos. Also the tutorial provided by Solidworks is pretty good. This software is easy to learn, use and has versatile application. Mechanical part design, 3D drawing, simulation, product design, load analysis. "One of the best 3D CAD modelling software"
I like the user interface. I have used solidwork for more than 3 years now. I have mostly used this for my school projects and very recently I started using it for my work too. The software is user friendly and it would be easy to use if you are using for the 1st time and have the basic know-how from other 3D modelling software. You can do 2D, 3D sketching, make parts and assemblies, drafting, sheet metal and even simulations. The material library is good and big enough to select the default materials and the software also allows you to create your own or edit the material properties per user requirements. They also provide student version for free (check with your school). One thing I do not like is the sketching. CATIA has that and is so good. Both CATIA and Solidworks comes from same company (3DS) so I wonder why so much of a difference. Additionally, I do prefer drafting feature in CATIA over Solidworks. Give it a try. It has tutorials for understanding the basics build in. Once familiar with the interface it should be easy to use, practice or navigate. If you are familiar with other 2D or 3D modelling software, it should be quick and easy to switch. I have used this at my previous company for making drawing updates and making changes to the existing drawing if and when required. "A powerful CAD simulation tool for a cheap price "
In spite of the fact that the rendering, brightening and the photo-realistic portrayal are not intense as those gotten with other CAD programs, they are still great and permit to picture the plans with a worthy quality. SolidWorks instruments are intense for little tasks, for example, particular parts and segments, however they are not productive for the plan of more mind boggling activities, for example, substantial engine cases. I have been using It for a long time and I have gotten a great experience from this tool. Another favorable position is its library of materials and the likelihood of making tweaked materials that can be put away in this library. You can likewise include and alter any content, and like other CAD programs, the plan work is done in layers that you can without much of a stretch select and change. I like its interface, I am using this software since more than 1 year, After using it I have realised that it is most userfriendly softwares into all I have learned, I like its all the sketching commands like Line, Circle, Centerline etc.. Also it will allow us to complete the sketch even it is not completed, Other softwares will not, I also like all the modeling tools, These all are much easier than othe softwares, Simulation tool is also easy and user friendly, The most important thing i like its pricing, It is most cheapest software in market.. I dont like its centerline function in sketch formate, because it is not infinite as creo parametric offers, but thats not a big deal, Also it gives fluctuated result in simulation as compare with ANSYS, But within this price it is not bad, I totaly dislike its drafting interface, We have to put points manually if we have to give dimension of odd part of drawing, Solidworks need to improve its drafting interface.. Currently I am solving business problems like 3d modeling, Simulation, drafting, rendering, assembly drawing for new product development with solidworks, The benefits I have realized that it is most userfriendly interface in aal of its function and most cheapest software as compare with other softwares..
"El mejor programa de diseño 3D"
Tiene una curva de aprendizaje baja ya que la interfaz gráfica es muy intuitiva en comparación con Pro-Engineer y CATIA. Muchas funciones y atajos de teclado. Hay recursos de muy útiles disponibles (paso a paso), por lo que puedo aprender el software por mi cuenta sin un curso. Me resulta fácil crear modelos 3D básicos de piezas y ensamblajes desde cero. El modelado es realista y eficiente cuando trato con un pequeño número de piezas. Recomiendo encarecidamente que al implementar Solidworks, inviertas en el entrenamiento de los empleados. Esto hará una gran diferencia en lo bien que se utiliza. Aprender a utilizar este programa en la universidad realmente me ayudó a crecer como estudiante y convertirme en un activo para mi empresa una vez que me contrataron. Diseño de productos y subproductos electrónicos, diseño de utillajes para la fabricación. Renderizado de piezas y análisis utilizando el método de los elementos finitos. "El mejor programa para realizar diseños 3D CAD"
Lo mejor de este programa, es lo intuitivo que es a la hora de utilizarlo, ya que viendo un par de tutoriales en Internet puedes hacer ya cosas muy curiosas, pero a la vez conforme vas cogiendo todos los conceptos y soltándote con el programa puedes realizar diseños muy profesionales e incluso ver en diferentes entornos, puedes dar diferentes texturas a las piezas, y como no mencionar la herramienta que te permite crear animaciones de por ejemplo un mecanismo que has diseñado, para poder mostrar a los demás el funcionamiento del mismo. Lo que menos me gusta quizás, tal y como suelo decir es el precio, que para aprovechar todas las funcionalidades que posee, pues tienes que desembolsar un buen pellizco, pero todo hay que decirlo y vale cada céntimo que pagas por él. A todo aquel que se adentre tanto al diseño de diferentes productos, tanto a aquellos que estén considerando crear su propia pieza para luego poder imprimirla en 3D, o para toda aquel que quiera realizar un diseño profesional de cualquier cosa que se le ocurra, SolidWorks es su herramienta sin duda alguna. Actualmente lo estoy utilizando para diseñar diferentes partes de un Formula SAE, el cual estamos desarrollando en la Universidad de Málaga, donde hemos diseñado el coche por completo hasta el último tornillo con esta magnifica herramienta. "Solidworks: Breathtaking CAD Software with some serious issues in some engineering"
Solidworks is an intuitive CAD modeller, everything from 2D drawings to extrudes by simply clicking and dragging the drawing from the canvas page. Also, in contrast from its competitors, Solidworks does not hide its options within a submenu of a submenu, nearly all the options that an average user will need will be located either on the canvas or on a very visible tab or on the design tree within the program. My main gripe with Solidworks is a fundamental one. When engineers need to do an FEA or a Mechanism Dynamic analysis there are not typical options that are available in other options. For example, if I needed to simulate gravity in a dynamics modelling issue then I can activate gravity and have it run in the simulation. However, i cannot have different forces acting in a piecewise fashion, meaning that I cannot simulate forces acting at different points in time in Solidworks nor can they be non-constant. This alone caused a few of my clients within the industry to stray away from Solidworks for anything but strictly CAD purposes. I would recommend that if you are an engineer or someone in the design field considering autoCAD to do your research and make sure that the simulations that your company will require can be done correctly on the software. 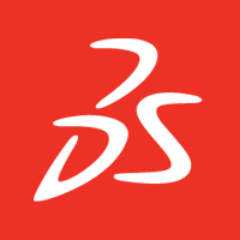 Solidworks since it is owned by the french company Dessault, does not often play nicely with other software. For example, I often need to check the outputs that Solidworks gives me after an analysis. If I need to submit these findings to a client, I need to make sure that the client has the correct version of Solidworks, has the correct modules in their software. Did I mention that solidworks charges for literally any extra module that you need however minute? "Been pleased for 9 years"
I love how agile this product is. It adapts to so many variables and uses, industries, and outputs. We use it for Steel Manufacturing, but it could be used for Electrical, Industrial Manufacturing, Plastics, Fluids, Piping, Architecture, anything where you are building, changing, or measuring a product that can be seen. I don't like toolbox. It is incomplete, and lacking on the Non-Metric front. It is unrealistic and doesn't reflect what is sold in a hardware store, let alone a hardware vendor's available supply. For a software that is so universal, I'm floored by the lack of detail in this particular corner of this product. Though design tables work pretty darn well and take the place of toolbox, almost. We just need to do more work to develop them to a similar degree. Solidworks makes 3D a breeze, and 2D even easier. Don't ever consider using a 2D software if this is an option for you. I've use 2D software and this is SO much faster to the same end goal. I use Solidworks to develop product documentation after our engineers develop their products. I like the overall functionality and compatibility of the software with other modeling programs as well as cnc and printing devices. I think that the software could improve by adding more comprehensive prediction and modelling features. It also has a very high price point, but the value is clearly seen. SolidWorks has so many features that can help speed up the design process. Weldments are useful features especially when used with 3D sketching. Learning SolidWorks is as pretty simple, once you have the basic idea of CAD in general. The layout is well organized to find essential tools. There are lots of options for additional tools from simulation to flow analysis and standard toolboxes. In a fabrication business this software makes taking a customer supplied 3d model a breeze in converting their part into a 2d flat layout for laser cutting. Greatly reduces the margin for human programming error and speeds up processing time for a faster turn around. This is most powerfull for 3D design and other software. Quick to deploy,to use and simple to administer. IT is spending time maintaining your cad system.it is easy to utilize for 3D design.SOLIDWORKS solutions cover all aspects of your product development process with a seamless, integrated workflow—design, verification, sustainable design, communication and data management. The intuitive design interface and integrated software work together and give you the freedom to focus on innovation, thus giving you the possibility to span multiple disciplines with ease. i am capable to such kind model and save to money and some time to our company. our company to do not such time of time waste that way to use software. "Solidworks is an intuitive program for CAD work." It's easy to figure out how to use the program. It has an easy to understand user interface. It appears to be a well-thought out program. You can use Solidworks for small parts or extremely large assemblies with multiple parts. I also am able to ask the company we purchased the program from for help with installing or reinstalling Solidworks, even though it has been many years since we purchased it. Sometimes there are bugs that inexplicably shut down the system. The memory requirements can sometimes bog down the processor. There are some things that you can't do with Solidworks. It is not as powerful a program as CREO or Catia, but it is less expensive. The license system is annoying, but necessary. Make sure you have lots of RAM. Take some training courses-you will learn things that you would have a harder time learning on your own. Use the internet sites for help-there are many users who have a great deal of experience and are willing to help others. I'm able to make prototype designs very quickly. The benefit is that I can make design changes without taking too much time, which saves money. Sometimes it's easier to see problems with an assembly if you can draw the entire thing first. "a great tool for CAD design "
I would say that SolidWorks should work more in the user interface as it was really hard for me to learn it in the beginning and a very important point is the assembly feature the assembly in SolidWorks requires at least twice the time compared to other software. I can model things up and visualize things quickly, creating renderings to get approval of a new design from key stakeholders. There could be a lot of improvements on functionality. Also, it looks outdated, like it's from the 1990's. It's awful if you want to work from multiple devices, such as work laptop & desktop, unless you buy multiple licences which is very expensive. It's hard to get into and can be frustrating at first, but eventually you get the hang of it. Create renderings for customers, to get approval of new product design. Send part to mold builders. The trend we have been seeing with our customers transitioning into a Simulation Centric Design approach. Mold makers take on most of the responsibility with using Mold Flow Simulation to identify any manufacturing defects within the tool but there is also benefits for you to be able to run a quick Fill Analysis on the part before sending it off to the mold makers. This program allows me to create a variety of designs that can be used to illustrate an idea or to actually build something. Although the learning curve is pretty steep once you learn the basics you can start making a variety of designs. The program allows you to create a single part, an assembly or a drawing. All of them have been really useful for me. Assemblies are created really easily and allows you to create the whole system with parts that you might or might not made yourself. Now days is very common for companies to share the CAD files of their parts, which means that without knowing how to create a part on SolidWorks you can know how the entire system will look like and also determine if what you were planning to buy is actually the right fit for you. This program is very powerful which makes my computer to sometimes run slow. In fact, I have experienced my computer freeze when I have had multiple designs open at the same time. I would recommend this software to any person that is planning to create their own parts or make assemblies from parts obtained from other sources. The learning curve is steep but do not get discouraged by it. Once you learn the basics you will find it very useful. I create parts that I need for specific applications. Those designs are then used in a machine shop to actually make that part. "Solidworks - the best CAD package there is"
Solidworks really is the whole package. It has a host of features that enable you to model practically anything that you can imagine. I use it constantly at work throughout the day everyday. I do many different models and simulations, and each one is always extremely accurate and easy to complete. Solidworks offers a much more complete and advanced package than programs such as Inventor and Fusion 360, which never let you model things that are too big. I have Solidworks 2018 that I use regularly at my job. It is sometimes very laggy when modeling a very large part or file. The load time to complete these tasks is always quite long as well. If you are in need of a program that can do anything from basic CAD models all the way to advanced simulations for injection molding, then Solidworks is the way to go. Solidworks helps me compete literally any CAD modeling task that I need to get done at work. "Experiencia de diseño muy intuitiva y con una curva de aprendizaje rápida"
La facilidad para modificar los diseños, pudiendo generar diseños similares con pequeñas variaciones. Partiendo de un diseño inicial, es posible ir realizando las modificaciones en la pieza y suprimir aquellas que no se ajusten, de una manera ordenada y sin afectar al resto del diseño. El ensamblaje de piezas, en el mismo formato que las propias piezas, es una ventaja frente a otros programas. "Highly featured user friendly Drafting tool"
Installation process is somewhat a bit difficult, cant do a common man himself, and Usage of RAM is too heavy. In next versions/updates, please mould the tool in a way to consume less RAM, and personally, i suggest you to add the 3D aesthetic feature like what "Adobe illustrator" provide. Then no other user will go to secondary tool, even after completion of drafting. "Great software for any type of CAD Modleing"
"Slow burn, but SolidWorks wooed me in the end and now we are in love"
GET IT and watch lots of youtube to learn. Then take the CSWP and CSWA but not in that order. You'll learn so much studying for those. Prototyping, design changes, making spec sheets. It's fantastic and I love that we can save in different formats like IGES, etc to send to customers who use different software. Please make feature recognition better! I use the manual one all the time because it gives me better control than automatic. But it doesn't do quite everything. "It is OK CAD system"
CAD file size grows enormously for complex geometry/big assemblies. DO NOT USE linear patterns! It's the industry standard for CAD. 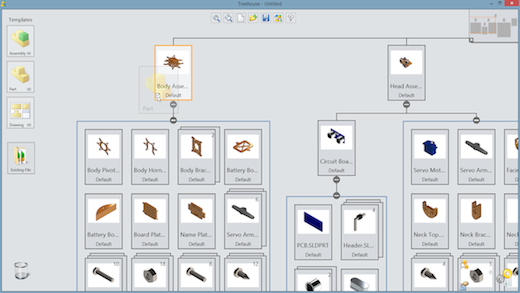 There are a lot of cool features that make your life easier IF you take the time to learn and explore such as path mate, dynamic mirror, limit mates, view mates and dependencies in feature tree in assemblies. I made a movable energy chain from watching a tutorial on youtube and using chain pattern and it came out really great, moved realistically and could figure out exactly how many links i needed. I like to use mouse gestures for all my most used commands. So many features that take time to learn. Need to know lots of little tips and tricks. Lots of little annoying things that many ppl just deal with for a long time and then later someone shows them how to solve it and it's an ohhhh moment. Crashes and slow with large assemblies. Would like to use simulation but we don't need it enough to justify price and have to use simulation xpress which doesn't work on assemblies. Flexible assemblies are great when they work but can become quite glitchy especially with larger assemblies. Pattern mate saves me a lot of time for mating screws but it only works on hole wizard features and if you mirror the holes outside of hole wizard, it doesn't work. Can move assemblies very realistically, making sure everything is the right dimension before ordering. Saving money and time. 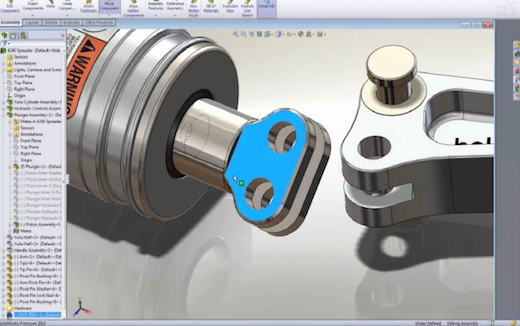 "Great for small to medium Assemblies"
There are a lot of companies that are switching to Solidworks which means that workers and clients have a common knowledge of CAD software. Solidorks has a great blend of surfacing and solid modeling tools that make it versatile for companies working on consumer products. With every CAD system, there are some quirks that can delay or hinder your CAD workflow. This includes how solidworks infers relations, creates references, and builds solids. You have to have several years of experience to learn these quirks and it is usually learned through long hours trying to rebuild the model. It is great for small to medium assemblies. It is quick to pick up and there are many tutorials and internet material to learn the program. Also, many consulting companies are switching to this platform because of their clients so this may be a factor to choose Solidworks over the other products. Building models from concept to production. Modeling parts and assemblies before sending it off to manufacturing. Also, capturing design intent and collaborating on product development with fellow engineers. Creating design drawings from 3D models to send to vendors and contract manufactures. "One of the most powerful modelling programs out there"
The use of equation-driven parameters and configurations in Solidworks is very robust. It is relatively easy, with a little practice, to create a model that is linked to a global equation file whose equations drive both sketch-level and feature-level parameters. When you layer on the use of configurations to modify parameters in those very same levels, you have a highly robust design system. It takes a little while to learn and a lot of time to master. What you can do with Solidworks is truly impressive, but it takes a lot of practice to get there. This is in contrast to Sketchup, which is accessible and easy to learn, but has nowhere near the same capabilities. Take the time to learn it well! It has seriously amazing modelling capabilities. Solid modelling, rapid prodotyping, production drawings, document control, and the list goes on. All of my companies production and prototype product design is run through Solidworks. "Out of Date relative to New Platforms"
I can pay for it once and then use it all by myself for myself, forever. Other than that, it's not that great. It is built on outdated technology, using copies of files as opposed to shared documents. It's not versatile with multiple devices, including mobile. The user needs high end, expensive hardware to run it. Service Packs, Yearly Updates make compatibility between users very difficult. It is a very expensive piece of legacy software that I need to pay for upfront. If you want outdated technology, use SolidWorks. Otherwise, use Onshape. I am not solving any business problems with SolidWorks. I solved my business problems by switching to Onshape completely. There's an enormous value associated with using the same package that your colleagues, vendors and customers are--a value high enough that it dwarfs the benefits associated with the features of any particular package. This is the "network effect" that has most of us using Windows and MSOffice. Translating between packages is an ongoing nightmare--do your best to minimize it by selecting a package that will be compatible with as much of your community as possible. It takes a lot of storage depending on what you're working on and it takes a very powerful laptop or desktop to run the automations and simulations on it. Cheap and vary reliable for academics and industry, Toolbar is well oriented and simple, Quick learning is possible, Wildly used in academics and industry. And its easy to show people. As intergrators we meet with clients and can show them on solid works before actually cutting POs and getting quotes. We can design on the fly with the clients via Skype. They are able to see what we have come up with to help solve the issues that they are having. We also use DSW to help predict engineering flaws and analyze risk. "Great product but light on the included FEA for the price"
My favorite part of Solidworks is the feature recognition which is great to have when you are going between different design platforms. The ability to explode assemblies is second to none. I wish there were more translators for exporting of parts. I would also like to see more FEA for structure analysis on the basic level. They also want to push you on purchasing a full license which is hard to afford as an individual contractor. A subscription offer would be nice that can be paid for on a monthly basis. I am able to provide my customers with quick design returns. With SolidWorks, you have a full history of what you do, so it's possible to edit everything at every moment and modification will be apply at the next steps. SolidWorks use mostly volumic modeling tools, that's allow easy 3D printing with complex CAD files. Another cool stuff with Solid is when a function doesn't work or if you have construction errors, the software will give you advice to handle it. It's so easy do build filet. Complex products are make in different parts and assemble in another one. During basic modeling, you can constraint dimensions, make modeling extremely precise. The surfacing modeling is not so powerful, but enought. The surfacing editing possibilities are a bite not enough to be really precise. For rendering, the UV map are not do by the software, so you will not have it to wrap texture, and an external software is necessary. The constraint system can make freemodeling a bit frustrating. SolidWorks has a strong tutoriel database inside the software. I learned almost all the basics/advanced tools with them. They are just in the right panel, in the "ressources" panel. And if you have no ideas about a tool, just use help software file, it's really clear and can teach you more than you can expect. It's a perfect software to exchange with engineer (for me, as designer), basicly it's a mechanical/scientist CAD software. With the construction history, you can evolve your design directly and quickly with the client. As a user since the mid-90s, I have always been impressed with Solidworks' commitment to continuous improvement and innovation. I have had the opportunity to watch this software grow and develop over decades and it still remains one of the best professional tools to date. With every major release of any software there are always bugs aplenty to work out, but Solidworks has a reputation at this point that the 0.0 release is really never stable enough for business use, only student. The biggest decision to make in your CAD ecosystem is HOW you plan to implement, either license server or personal editions. It will make a huge difference in price, manageability, and performance down the road so it is worth taking the time to research and be sure. Fast visualization of complex parts, motion studies of assemblies, structural analysis, cable routing, thermal analysis, optical path mapping, ray tracing...there aren't many uses we HAVEN'T put this software to in my career. My brain works well with math and being able to dimension things. Solidworks is the perfect for engineer minded people. It is a very easy program to use and learn and they give you all the tools to learn efficiently. I wish you could get a little more creative with it in the aspect of sculpting and free forming things, but I understand why you can't. You either get a program based on numbers or the other. Maybe in the future they'll be able to incorporate some of the awesome things you can do with the animation softwares like blender. It worked perfectly for what we needed and that was to create dimensional shapes for rendering and production. "In the university it has allowed me to make some models in 3D to present some concept." SolidWorks has a nice user interface and easy to use, when you are starting to learn, it is quite useful tutorials that have to take you step by step through the process of creating a 2D view to a 3D. Generate plans and views is easy and comfortable to present or pass them to reality with a 3D printer. One of the best options that this software has is the rendering and the animations, but it is not very easy to use, and it takes a lot of time to understand the operation, besides there are not many templates to put the 3D models in different places. you can use this software to find flaws in the designs without the need for experiments, nor prototypes. This software basically save a lot of time and money. "Excellent software to design and produce almost anything!" I like the ease with which you can make changes to a design you have already done if you need to. Also, how you can go up in the feature tree and make changes in specific features that just roll down with the rest of the model. Some really useful functions are kind of hidden and you need to know that they are there in order for the user to be able to access them. Also, the lack of option to save in an older format makes it difficult to share models with people that are not in the same version as you are. The software is pretty easy to learn, even by yourself, once you understand the underlying concepts of how it functions (feature tree and hierarchy). You should also think about taking advantage of the multiple offerings for specialized training by the re sellers or other entities; however, going with the training given by an authorized re seller is encouraged as they tend to be deeper and they are up to date with the software all the time. Your machine should also have enough power to easily have multiple projects open, specially if you're thinking about using assemblies. If thinking about using multiple seats and that everybody is going to be working with the same models, have in mind the PDM plugin, as it will make your life easier. We can translate design intention faster to production ans also modify the design easily and quickly, which translates into increased productivity and lower production costs. "SolidWorks is the tool you need for Manufacturing & Design"
SolidWorks versatility and easy of use has made it my go to design tool now for almost 20 years with various manufacturing and design companies. Various add on programs are continually being developed and refined to make life of the designer or engineer easier. It allows for mock ups ranging from basic shapes right up to massive complex high detailed assemblies and layout models. The ability to look thru models or assemblies are various stages and observe fit or space issues well before anything has been cut or created, especially being able to "slice" thru models or assemblies and see how they fit up when made or created virtually. The only dislike I have ever had is with something the initial costs investment for the license when very small businesses or start-up companies are tight with funds. Contact with SolidWorks authorized resellers usually come up with creative financing to assist those with limited capital. There isn't really anything to dislike other than that, as once you understand what options and addition programs are available ... the sky is really the limit. Contact a local authorized seller and ask them for a demonstration, as well as a hands on session to evaluate SolidWorks for yourself. I have always found resellers helpful in showing what possibilities with your company it can open, as well as best practices. Problems that have been solved have ranged from simple shop based jig and fixture arrangements, to electrical & hydraulic schematics, as well as complex manufacturing assembly planning. The ability to create various versions of a model and change it within an assembly, as well as create new parts from older parts has been a major time and cost savings. Being able to show a potential customer a design or product before hand, and show them how changes affect their product also aids in the customer relationship and is a "value add" to the company. I am able to model a big scale theatre and every part is shareable with my team. As I progress I can easily check in my model and my team can quickly see the changes. Sometimes it does crash constantly, this is able to be fixed using the correct computer and graphics card. Another issue we have is that files get corrupted and it takes time to be able to back up the drawing or model. It is a great Software to use especially in the technical designed field. It is one of the most software use in the Entertainment industry. Be aware you do need a compatible and quality computer so it won't give you issues and an understanding of 3D modelling. For example, if I'm designing a structure that attaches to the facility and I have to figure out if there any collisions this software is great to see the space in 3D and concur if it will ultimately work. "It is an extremely powerful 3D CAD software that is easy to learn." The user interface is really easy to learn and use. It is very powerful with the way that models and drawings can be created. We use it to model each step of our manufacturing line and it can easily show how parts will look at each step. Sometimes non-native files open up as surfaces rather than imported bodies. This proves to be difficult for us because we end up having to recreate the models. If you have never used a 3D CAD based software before, take an intro class or do the tutorials embedded in the program. Once you complete these, you will be a well versed user. We use it to model each step of our manufacturing line, and then take the models we create and use them in other programs such as MasterCAM and Calypso. We are easily able to see how the parts will look after each operation. Hard to pick a favorite thing but I've worked with Creo and AutoCAD and find Solidworks to be more intuitive and easy to use than the rest of the CAD programs that I've worked with. I feel I need to mention that Solidworks is the CAD software that I was originally trained on so there might be some boas there. In a previous job I was instructed to create some small parts or drawings that we would be using for SLA's. The number of items that needed to be created made Solidworks run very slow. In working with their customer support it was found it was the program and not the computer with the issue, however, this was a year or two ago and I have not created anything with quote the same number of items since. My primary use of solidworks is related to tool design in a manufacturing environment, so both 3d models and 2d drawings. It's easy to figure out how to use the program. It has an easy to understand user interface. It appears to be a well-thought-out program. You can use Solidworks for small parts or extremely large assemblies with multiple parts. I also am able to ask the company we purchased the program from for help with installing or reinstalling Solidworks, even though it has been many years since we purchased it. It is also great that I can have detailed prints for the manufacturing department in a timely manner! Sometimes there are bugs that inexplicably shut down the system. The memory requirements can sometimes bog down the processor. There are some things that you can't do with Solidworks. It is not as powerful a program as CREO or Catia, but it is less expensive. The license system is annoying but necessary. I run into the most problems in surfacing. SolidWorks is a very powerful program but make sure you look up prices of add-ons and packages if your industry uses simulation, analysis, you need a seat of SolidWorks Pr, ect.. The packages add up quick! I'm able to make prototype designs very quickly. The benefit is that I can make design changes without taking too much time, which saves money. Sometimes it's easier to see problems with an assembly if you can draw the entire thing first. Great classes online too! "SolidWorks is the best Mid/Upper End Parametric-Modeling Software"
Of the two parametric-modeling programs I have used (SolidWorks and Inventor), SolidWorks is ny far the more user friendly. The layout of SolidWorks is much easier to navigate, and it is very easy to edit features after they have been created. The weldments feature is a powerful tool to create frames with extruded profiles (channel, iron, extruded aluminum, etc.). Assemblies are easy to make, and drawings are straightforward. Since the software is not backwards compatible, SolidWorks must be updated annually if collaborating with other firms who update regularly.I understand the business reasons that Dassult Systemes does this, but it can be expensive and frustrating. Even though it's expensive, update the software annually. If you collaborate with others and they use a future version, you will not be able to open the native SolidWorks format. There are workarounds (such as using STEP files), but they lose functionality from the native format. I use SolidWorks to create 3D models and drawings of parts to be fabricated for custom medical-device manufacturing equipment. Depending on the complexity of the part(s), I can go from concept to model to drawing in less than a day. "Solidworks is user friendly "
Solidworks is pretty easy to learn basic modeling, and one can go as deep as you like. There are many times where Solidworks crashes and needs to be restarted. This is great software for the beginning user, the intermediate user or the advanced user. It has an easy to use Graphical interface for parametric modeling, ideal to make product design and continuous improvement in product life management. it has PLM tools. It has links to online tutorials to get you started, and more advanced modeling tutorials for complex surfacing to go deep into the software. "Industry-leading software, with a slight learning curve"
The integration with CosmosWorks and PhotoWorks makes SolidWorks very intuitive and a one-stop shop for design. Similar to AutoCad's "Inventor," it lets you start from scratch and build a working visual model in under an hour. Whether it be a doorknob, a custom nut and bolt, or something as complex as a fully mechanically operational hand with hydraulic digits and opposable thumbs, SolidWorks can do it. You can set materials to certain parts, and set certain pieces as gears, pulleys, belts, springs with specific tensions, and then set physics in motion by specifying the kilonewtons of force being applied to certain parts of it. If you need to know whether punching a hole in an L Bracket will create a stress riser bad enough to bring it to fault below tolerance, you can even run its automated software to do the math for you and define the max size of the hole allowable. When I was using it, it was to design parts which would later be brought over either to GibbsCAM (for machining) or used for testing using CosmosWorks. I learned how to CAD with solidworks, so my familiarity with it is high; even through version updates, everything felt very familiar. The tools are powerful and could accomplish everything I needed. The desktop client aspect also allowed it be used with 3D mice, where each button could be customized to a feature; the options were endless when it came to customization. The price, outside of education discounts is pretty steep. Additionally, the yearly updates prevent backwards compatibility, which isn't great if you can't afford new version. Solidworks is great software, but can be pricey. If you can afford it, the only additional purchase I would make, if using in a group, is to get the pdm. Versioning can be difficult, but the pdm helps. I used solidworks in school, so no business problems, but It allowed me to create numerous products, from medical devices to robots. Everyone was using it, so collaboration was great. "Solidworks as a path to 3D modelling"
Solidworks has evolved over the last 10 years so much that It feels like an easy to use software for even the very new users. The interface is so user-friendly and the tips are just around the corner. The finite element analysis should be more robust if it's compared with the specialized FEA software like ANSYS and COMSOL. Solidworks does make it easy for the new user to get their hand dirty with solid modeling and drawing. I would definitely recommend it to others. The 3D drawing of the complex parts along with the post analysis of them. "Great CAD package with lots of add-ins"
Solidworks has great tools for building weldments. I love 3D sketching. 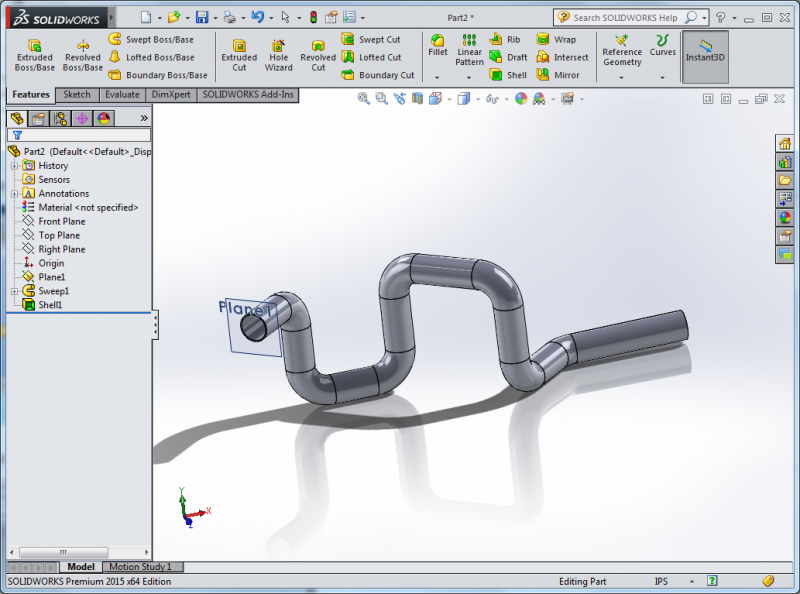 The hole tool is a simple thing, but it has a lot of power in Solidworks. Being able to create a sketch in-feature is really convenient. Solidworks is expensive! It is a professional CAD system, so that makes sense, but it is still very pricey. It is difficult to share solid models with vendors or others as well. Also, my company purchased a brand new, high-powered workstation for me to use and Solidworks still crashed on it. That is very annoying. Any designing is great in Solidworks. We also create solid models of our facilities to help us plan manufacturing lines.